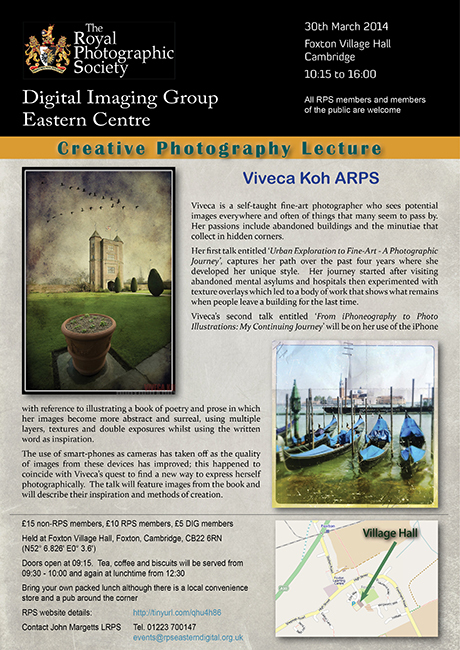 Two lectures by Viveca Koh have been organized by the RPS Digital Imaging Eastern Centre. Viveca is a self-taught fine-art photographer who sees potential images everywhere and often of things that many seem to pass by. Her passions include abandoned buildings and the minutiae that collect in hidden corners. Her first talk entitled ‘Urban Exploration to Fine-Art – A Photographic Journey’, captures her path over the past four years where she developed her unique style. Her journey started after visiting abandoned mental asylums and hospitals then experimented with texture overlays which led to a body of work that shows what remains when people leave a building for the last time. Viveca’s second talk entitled ‘From iPhoneography to Photo Illustrations: My Continuing Journey’ will be on her use of the iPhone with reference to illustrating a book of poetry and prose in which her images become more abstract and surreal, using multiple layers, textures and double exposures whilst using the written word as inspiration. The use of smart-phones as cameras has taken off as the quality of images from these devices has improved; this happened to coincide with Viveca’s quest to find a new way to express herself photographically. The talk will feature images from the book and will describe their inspiration and methods of creation.